Sweeping changes proposed to the federal Endangered Species Act have conservation groups and others alarmed about protecting plants and animals on the verge of extinction in Maine and around the country. Critics of the 45-year-old act say it has been a failure, with less than 3 percent of threatened or endangered species ever coming off the list. But supporters point to a range of other benefits that come from recovery efforts, and in a state like Maine, they say they aren’t hard to find. At Goose Rocks Beach in Kennebunkport, stakes and twine mark off nesting areas for threatened piping plovers. The markings are taken down by the end of August, when the chicks have hatched for the season. If they haven’t already left, the chicks are preparing to make their fall migration as far south as the Gulf of Mexico. The sparrow-sized shorebirds first made the endangered species list in the late 1980s, and Laura Minich-Zitske, director of Maine Audubon’s Coastal Bird Program, said this has been a good year for them. “We had more nesting plovers than we had since we began monitoring in 1981: 68 pair. It’s not a lot, but for us it’s good,” she said. 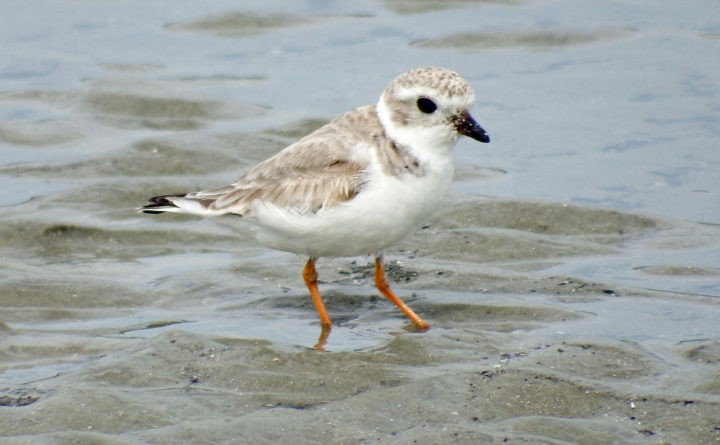 Piping plovers were a common site along beaches until the late 19th century, when their feathers made them and other birds a sought-after target for hunters and the hat-making trade. The Migratory Bird Act of 1918 helped restore some of their numbers, but then beach development and recreation took a toll. “I feel personally responsible because we have taken their home. I am living in their home and I am thankful to be here and happy to share,” resident Carol Sherman said. Sherman said she has seen the population of Goose Rocks Beach and development grow over the past 75 years. She has been coming here since she was a child, but about seven years ago she and her husband bought a house and moved in full time. Sherman said her first introduction to their new neighbors, the plovers, wasn’t exactly positive. Since then, Sherman said she has learned more about plovers from staff at Maine Audubon and Maine’s Inland Fisheries and Wildlife Department. The more she learned, the more she grew to love them and realize that plovers are good neighbors and good parents, courageous in the face of all kinds of ecological and other challenges. Sherman said she doesn’t mind following rules to avoid interfering with their nesting sites. But recovery efforts for plovers and all kinds of imperiled plants and wildlife could look a whole lot different going forward. “We’ve seen species such as the bald eagle come back from the brink of being almost completely wiped out. That’s a great example of what this law was intended to do,” said Republican Sen. John Barrasso of Wyoming, who is among those in Congress pushing for an overhaul of the Endangered Species Act. Speaking on the floor of the U.S. Senate in July, he said a new approach is needed, because unlike the bald eagle, only about a small percentage of protected species ever make it off the list. “I’m a doctor, and as a doctor, if I were to admit 100 patients to the hospital and only 3 of every 100 recovered enough to be discharged, then maybe those patients should look for a different doctor. We’re in the same situation now with the Endangered Species Act,” Barrasso said. Barrasso is proposing that states be given more control over management of endangered species. House Republicans and the Trump administration are also proposing changes to the act. Reaction from environmental groups has been swift and fierce. Brett Hartl of the Center for Biological Diversity told the Huffington Post that the changes would “slam a wrecking ball into the most crucial protections for … endangered wildlife.” He also said that if the Trump administration’s regulations had been in place in the 1970s, the bald eagle and the gray whale would now be extinct. “The fundamental thing that is concerning is the changes are very insidious,” Minich-Zitske said. Minich-Zitske said she objects to a proposal to stop treating threatened species the same way as endangered species. Instead, protections would be determined on a case-by-case basis. “What it really boils down is ‘foreseeable future’ is to be defined on a species-by-species basis, which leaves a lot to political whim rather than scientific evidence, which is very alarming to me,” Minich-Zitske said. “We are very concerned about rollbacks or attempts to weaken the ESA,” Tom Abello of the Nature Conservancy’s Maine chapter said. Abello said it’s one thing to make improvements to the endangered species act to ensure that there’s some flexibility, but it’s another to restrict funding for species protection and make changes that aren’t based in science. He points to endangered Atlantic salmon in Maine as an example of how listing helped encourage dam removal and restore rivers even if the salmon’s numbers haven’t significantly responded. Along the way, Abello said, the efforts have aided other species such as alewives. Back at Goose Rocks Beach, Virginia Almeder said she thinks about that as she looks out at the ocean from her deck. She’s worried about a recent spate of seal deaths and reports about endangered right whales getting trapped in fishing gear. All species, she said, deserve more protection, not less. “If we take out one link in the chain, it affects all species, including us. The emphasis seems to be on making money, unfortunately,” she said. Written comments on the Trump administration’s proposed changes to the ESA are being accepted until Sept. 24.